Most people are willing to admit to being afraid of death. They are afraid of their own death as well as the deaths of those whom they love. This does not mean that most people are cowards, but rather that they are afraid. To be afraid does not make one a coward. It is how one reacts to fear that makes one a hero or a coward. During the shootings at Fort Hood, many, if not all, were afraid, but the soldiers under fire were able to react to subdue the shooter and to aid those who were wounded. To be brave means that one admits fear and reacts positively in spite of the fear. Humans are remarkably resilient. Each person exhibits bravery, not only in the face of danger, but also in daily living. Mothers and fathers watch children go off to school, work, on trips, and to parties and other events that could possibly bring harm to their child. Parents generally learn to cope with their fears for their children, but sometimes, their fears for the worse become a reality. Yet, even then, most survive remarkably well. The resiliency of humans is remarkable. Death is a very difficult thing. It forces itself upon one violently taking away everything that one hoped, dreamed, and believed for the loved one. The agony of Jesus in the garden of Gethsemane shows that the human side of Jesus also feared death. Catholics may fear death and deeply miss their loved ones who have died, but they remain steadfast in their belief that they will join them in heaven when they die. All parents dread the deaths of their children, yet they know that all must die. The choice to become a parent dooms the child to an eventual death. As your parents made that choice that resulted in your birth, you may make the same choice for your children. Knowing that you and your children can be saints together in heaven, loving and growing with your children in this life, and the sense of community that comes from being a family in your parish makes it all worthwhile. To lose a quality relationship is devastating. The grief that results can be crippling. While each of us grieves differently and we also grieve differently for each person who dies, we can develop patterns of coping. Others around us do not grieve the way that we do. Others may observe our behavior and actions, but they cannot feel what we feel. Others may experience the same loss that we have, but our response is not the same as theirs. They may in kindness say to us, “I know how you feel,” but they do not know. Sometimes we do not even know “how we feel.” Grief is private and cannot be easily shared. Sometimes the person who died is the only one with whom we can share our grief. We may talk to them, visit with them at the funeral home or cemetery or imagine them being with us. Perhaps, they are with us. Each of us is a product of what we have experienced in our lives. They are part of our experiences; they are a part of who we are. They give us meaning and help us continue to make meaning even when they die. 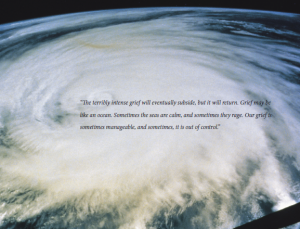 The terribly intense grief will eventually subside, but it will return. Grief may be like an ocean. Sometimes the seas are calm, and sometimes they rage. Our grief is sometimes manageable, and sometimes, it is out of control. One does not return to normal after suffering the loss of a loved one in a violent death. Perhaps, we should examine what normal really is, and who might actually be normal. Life is full of both blessings and burdens. Perhaps those of us who suffer losses are more normal than those who do not. No matter what you feel or emotion that you experience, it is okay. Feelings are not the problem. We cannot help it if we have blame, hate, fear, or whatever, but we can help how we choose to respond to those feelings. Others around us may seem to not hurt as much as we are hurting. We may choose to mistreat them because they are not grieving as much as we think that they should be. We may choose to ignore or avoid others around us because we have so much pain that we cannot give them the love that we would usually offer to and receive from them. We do not all grieve the same way nor do we grieve the same way for the many deaths that occur in our own lives. While we grieve differently, we also grieve in similar ways. We may cry with tears, avoid tears, we may play or work to avoid thinking about the death, we may go into seclusion, we may immerse ourselves with people, we may choose to play a tennis match after the murder of a sibling, we may spend our time praying, and a host of other options. No way of grieving is wrong. Some are just more effective than others. Each of us has our own style of coping with loss. We learned our coping techniques from those around us. Some of those styles were effective and some were harmful. We may think that others are not grieving because they seem not to be showing any emotion. Each person has their own style of coping with grief. Each of us needs to be free to not only live our own life, but also to find our own style of coping. In a family, the one who returns to work first if both work is generally the one who seems to be coping the best. For some, work is like therapy. It allows them to deal with stresses and to better think about things. 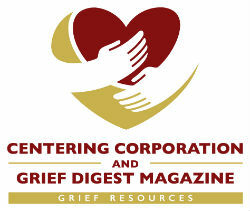 For others, it is a way to avoid managing or coping with one’s grief. Work becomes a distraction that then delays the intense grief. Work associates may compound the problem by not knowing what to say or do. It is like the loss never occurred when one is at work and such a great loss when one returns home. No size fits all. Each of us has to learn what style works best for us. As Alcoholic’s Anonymous is quite helpful for some, it fails many others. No one therapy, approach, or style of coping works for all. Friends, family, caregivers, clergy, social workers, physicians, and loved ones often compound our efforts to cope by their own discomforts and attempts to be helpful. The lack of coping skills of those around us can further compound our own efforts to cope. A friend who lost two teenage children in a devastating car wreck was told, “at least you have another child.” This is not helpful, but given as a well-meaning statement. At the same time, those who have developed positive coping skills can be of great help to us when a loved one dies a violent death. Coping skills are needed to help us mange all kinds of problems in life. Each of us faces losses every day in our lives. Crises are a part of life. Change will always bring loss, even when change is welcomed. Going to school for first time may have been a greatly anticipated event for both the child and the parents. Yet both parent and child suffer loss when the event takes place. Few children dread graduation. Many cannot wait for graduation to occur; yet, when it happens, they experience loss whether it is from kindergarten, elementary school, high school, or college. We leave home to go to kindergarten with anticipation yet dread of leaving our safe home with our mother. We graduate from high school and lose our place among our childhood friends, and yet we eagerly anticipate what will happen in our lives. With loss comes growth. People move, lose jobs, retire, and they die. The skills that allow us to manage life’s burdens can be changed into life’s blessings. Coping skills are needed to manage divorce, widowhood, aging, and other crises in the cycle of one’s life. Such skills can help us better manage when a loved one dies a violent death. For most of us, the biggest obstacle to coping is that we focus on what we lost rather than on what we had in the relationship with the deceased. In every relationship, there are good times and bad. The bad times may not have kept us from loving them in life. This bad event does not end our love nor our relationship with them in life. They are still a part of us and still impact what we say, do, and think. Their death ended the relationship as it previously existed. We can still keep them as a part of who we are and what we are. We can be enriched that they were a part of our life. Remember the good times and accept the bad. To cope with the death of a loved one, we must remember that others do not cope in the same way that we do. Do not be impatient with your spouse who seems to not grieve as much or at least as openly as you do. Do not break off your relationship with friends or family members who seem to try to minimize your loss. They, too, are grieving and are usually trying to help you in their stumbling efforts. Your mother may put away the pictures of your husband who died. It is not that she does not care, but rather that she does care about you and is trying to take your pain away. We cannot take away the pain of loss from others, but we can help them to face it and to cope with it. It is helplessness rather than heartlessness that causes those around us to say and do the wrong things. To cope, one needs to recognize that there will be good days and that there will be bad days. Like the ocean, our ability to cope with grief ebbs and flows. Holidays, anniversaries, birthdays, and so forth will be faced with dread and a desire to avoid anything to do with them. Coping will require that we make our loved one’s a part of these days. Perhaps you might buy a present for their birthday, Christmas, or whatever and donate it to someone else of their age after having a ritual in honor of the person who died a violent death. Their death does not remove them from your life. You can find many creative ways to continue to include them in your daily life. Bad days may also for seemingly no reason. Time goes by and you think that things are better. Then, suddenly, you have a bad day. That is normal. It is normal to experience pain and all sorts of feelings when one is grieving. Time is not a healer. Feelings are not bad. The emotion itself is blameless. To have a momentary feeling of hatred is not wrong. To kill the drunk driver is. To cope, eventually, we must come to accept what life has given to us and go on. The pain of grief does not go away, but rather, we learn to live with the pain. 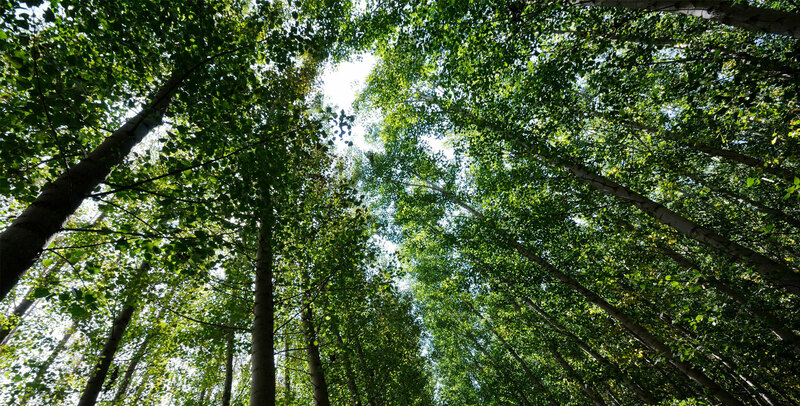 One approach to managing death is spirituality. With each person, our relationship is unique. Each of us allows others to become a part of ourselves. We give meaning to our lives through our relationships. Others become part of who we are. Any parent would acknowledge that when the child was born, their life changed forever. Friends become part of our hopes and dreams as well. Not only do we lose the person, but we also lose our hopes and dreams as well. We also generally seem to think that we will die before the other person. Perhaps, we want them to grieve for us rather than have us grieve for them. The closer one bonds with the person who died a violent death, the greater our sense of loss. When these relationships are severed, we flounder. We have many bonds in our lives. We may bond with the doorperson in our apartment building, with the mail-carrier, with the person who serves us coffee at the coffee shop, with co-workers, with celebrities, with strangers who offer us a smile, and with thousands of others who become part of our lives. We also choose to bond at an even stronger level with friends, partners, children, parents, siblings, and others. The loss of several class mates to violent death in school, the death of a childhood friend’s father to a drunk driver, the loss of family members in childhood, the loss of a trusted friend in a helicopter crash in Viet Nam, the loss of a cousin in a car crash, and countless others still haunt me years later. Every year of my life, someone close to me has died. Some were closer than others. Some died violent deaths. While all deaths give hurt, violent deaths seem to give more hurt. 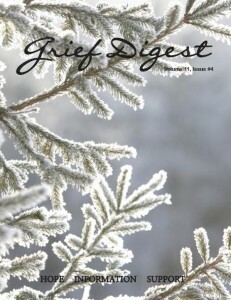 This article originally appeared in Grief Digest Volume 11, Issue 4. With each of the significant people in my life who have died, I choose to bond with them. With some people we bond before we even know them. The person who gave you a smile that turned your heart and later became your spouse and best friend, the person that stood tall and erect in the face of danger who became your commanding officer, the person who gave the sermon that changed your life who became your parish priest, and the child in the womb who became the love of your life. Others became part of your heart because you were thrust together in war, the Peace Corps, work, sports, or other important parts of your life. These and many more became a part of your life because you choose to allow them into your heart. As we bond and choose to bond with others who become part of our life, we also must know deeply in our hearts that everyone that we love will eventually die. While knowing this may give us anxiety, it may also allow us to appreciate our relationships before they are lost. We marry, make friends, have children, become attached to strangers knowing that all relationships end. If we knew that the person next to us in the airplane would never be seen again, would we bare our soul to them? Or do we bare our soul because we know that we will not ever see them again? Is the choice to bond with another time bound? Would we say no to the relationship if we knew that the relationship would end in twenty years? Five years? A month? A day? At what point would we decide that to bond and suffer the grief of loss is too great of a cost? If parents knew that their baby would only live a day or die at birth would they take the baby anyway? If the baby lived for sixty years would that be enough? When we choose to have babies, marry, make friends, and so forth, we make that agreement. Is your life better for having bonded with another person if only for a few hours? We simply do not know how long we will have our relationships. Time is not the issue. The real issue is the quality of the relationship.